After studying the key metrics including industries, website visits, documents which were downloaded by the individual sectors, we produced a dataset of the Top 10 Industries interested in mobile learning. Want to see the rest of the list, check this out here. Human Resources has been faced with the aim of growing and evolving over the past few years. Because employees are the biggest asset to every company, HR communicates with employees from the pre-hire to the severance stages. HR is faced with an abundance of responsibility. Due to that responsibility, human resources are charged with duties such as relationship management, leadership, conflict resolution, communications, critical evaluations, and consultations. HR often heads up the training efforts for the entire organization, so it’s not too surprising that mobile learning would factor into their areas of interest. According to Deborah D. Waddill, Ed. D., the author of Digital HR: A Guide to Technology-Enabled Human Resources, many of these duties can be supported and enhanced by mobile technology. Waddill believes that executives, small business owners, and those with HR responsibilities need to use new methods to incorporate formal and informal learning, and leadership development methods– and what better way than via mobile? Mobile Learning (or MLearning) is just what it sounds like– using a mobile device (smartphone or tablet) for learning (primarily be learners who are also mobile). One of the biggest reasons mLearning is so valuable is because as of January 2018, about 77% of Americans owned a smartphone, which is up 35% from 2011. Waddill argues that due to the increase in mobile devices, there is an advantage to using them for work: training. Human Resources can use mobile learning to give remote employees access to company-wide webinars, give learning courses to employees who are commuting to the office or just give workers access to information they need to know while they are on the go. A few big benefits of mLearning can customize the delivery characteristics (i.e., online, blended), length (i.e., days, weeks, months), and structure (i.e., training, onboarding, mentoring, or social). Federal Student Aid, FSA, is an office with the U.S. Department of Education. Recently they conducted Instructor-Led Training to help employees improve their critical thinking skills, but not all of their staff could attend. To fill this gap, FSA delivered the content to anyone who missed the opportunity, and they did so by hiring Designing Digitally, Inc. to provide an online and mobile course to the content. Designing Digitally, used Adobe Captivate to build the solution. The developers designed the module in a non-linear structure so learners could navigate to any topic of interest. In addition, the course will records and bookmarks all topics and slides that the learner has viewed. The application has buttons large enough to easily use on any smartphone, and the screen content is minimal to ensure that the content can load quickly when wifi or data connection is limited. It took additional care to direct disabled users to an accessible version of the content to increase inclusive and ease of use for everyone. Now, all employees can access the learning material and work through it on their own time. There is no longer a need to schedule a specific room and time for employees to attend. The employees can just pull up the learning content on their phones and use as a reference- both at and away from their desks. Float Assists HR Teams with their Mobile Learning Needs, Too. Float also see potential in this area and has been working on creating a system for onboarding and training via an easy-to-use and customizable mobile app called SparkLearn®. SparkLearn®offers companies the opportunity to work alongside our developers to create a learning platform to train new employees. 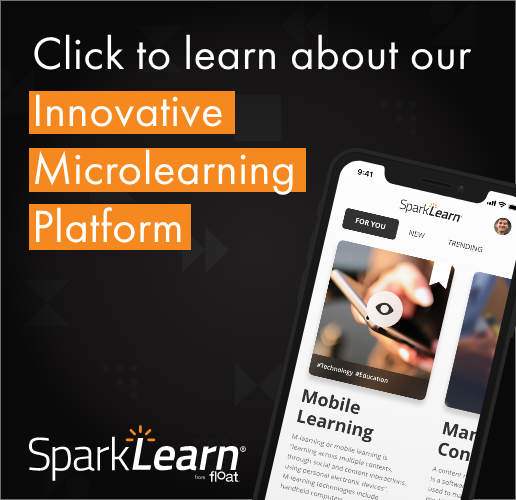 Float understands that rapid delivery is essential for mobile learners in high-velocity environments, and it’s platform, SparkLearn®, owns a flexible content management system (CMS), responsive web interface, and an intuitive mobile application. The app was designed with Float’s renown capability of creating great mobile solutions for some world’s largest brands, such as Microsoft, Nike, Home Depot, and more. SparkLearn® allows for the import of assorted content, including training/onboarding content, documents, presentations, and lots more! The application interface is even flexible enough to support the content created directly within the system, and can be branded to match the identity of your company! The app can provide performance support tools like searching within the app and diverting information to find easily later. HR departments will never have to worry or wonder if new employees are finishing their onboarding courses or modules again. All the user activity within the app is tracked with the industry standard Experience API (xAPI). In addition, it can also enable other analytics tools like Google Analytics to plug into the system so that managers and those within the HR department can keep track of a new employee progress. Your company can write and distribute short-form eLearning content to mobile apps for iOS and Android (smartphones and tablets) and responsive web for desktop users. With SparkLearn®, you can associate websites, PDFs, PowerPoints, and so much more alongside training courses for use as a job aid, performance support tool, and more. The flexible metadata makes everything within the app is searchable. SparkLearn® can let users learn– even when they aren’t connected to the Internet. Just sync your device when connected to Wifi and view the results later. Your Learners can easily favorite and mark content for later review, enabling access to performance support when they need it. In addition, their usage and history are always available to them so they can view what they have finished and what they need to complete later. So what do you think? What are your thoughts on how mobile learning is used within the human resources industry? Can you think of any other examples? Are you in the HR industry? How are you using mobile technology with your employees?